Persistently high raw material prices and declining global demand for steel products are holding steelmakers margins in a vice-like grip. MBR’s cost analyst presents the implication of current cost conditions for the long and flat products markets. - Declining Russian demand- how will Russian LSAW mills respond? - Price outlooks – will LSAW remain competitive against HSAW linepipe? - Will we see a recovery in the offshore OCTG markets? - Will current prices prevail or are we headed for a correction? - Are there opportunities for capacity enhancement? Join our consultant Kirstine Veitch as she looks into the Chinese aluminium market. How is this impacting Chinese carbon markets? How is this impacting the rest of the world? Join Indices Analyst Jon Mulcahy for a free webinar looking into the iron ore price trends and the key drivers affecting the market. The latest outlook for the global large-diameter linepipe market & overview of the new large-diameter linepipe intelligence service, from Metal Bulletin Research's Tube & Pipe team. MBR presents its latest outlook for the OCTG industry, using its brand new interactive online database and insight from the latest 5-year study. - How are the OCTG markets recovering worldwide? - Which regions are recovering quickest? - How is global supply responding to the changing market dynamics? Atilla Widnell, Metal Bulletin Research, discusses the Chinese steel industry and how wider margins in this market have affected the consumption of steel raw materials. Get Atilla's expert outlook for the steel raw materials market with this free webinar. Join Metal Bulletin Research's team as they discuss the aluminium market, providing valuable insight into recent industry developments and the outlook for the market. • Prices stall, but what is ahead? • How do premiums fit into the picture? Join us and get the chance to submit your questions, either before by email to info@metalbulletinresearch.com or during the Q&A session. Metal Bulletin Research is the leading independent provider of market analysis and forecasts for the global metals industry, including short and long term forecasts for all aspects of the aluminium market. In this brand new webinar, Metal Bulletin Research will be examining the current conditions in the global industrial and structural tube and pipe markets, paying particular attention to the cost drivers for seamless vs. welded tube and pipe. There has been a notable de-coupling of the welded and seamless markets in terms of price movements. Through our analysis, we will give our forecast of price movements through the fourth quarter of 2016 and whether this separation of welded and seamless fortunes will continue. As the only independent information provider following many of these niche markets, the Metal Bulletin Research team have unique insight in this sector. • How long will the price run-up last? • When will seamless mills catch up to rising scrap costs? There will be time for Q&A - you may submit questions to our experts during the webinar or before by emailing info@metalbulletinresearch.com. We look forward to sharing this market insight with you! Following a turbulent time for OCTG and recent developments for Linepipe (including 3 million tonnes of orders in March), are we about to see a market turnaround? - How have the OCTG and Linepipe markets developed in the past year? - Which trends can be seen globally and which are regional? - What is the outlook for OCTG and Linepipe? Amy Bennett, Principal Analyst for Metal Bulletin Research and AMM Research, presents her findings for the North American steel market in this informative presentation. Hear her overview of the global steel market, followed by a closer examination of the US market. The cost implications of environmental legal framework remain increasingly acute for global steelmakers in the light of tightening regulations. EU steel industry was the first to face additional legally imposed costs. In 2016, EU carbon market is forecasted to turn into deficit for first time because of reduction in the number of free allocations. Coupled with sliding steel prices amid exuberant cheaper steel supply from China, it is expected to result in EU steel makers potentially struggling to absorb the new costs in the light of thinning margins. 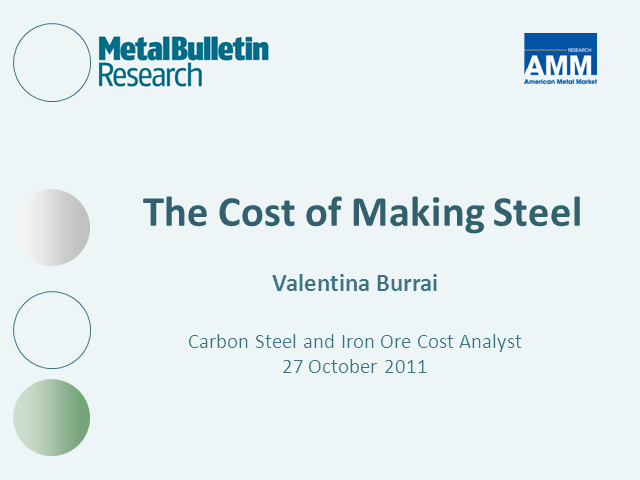 • What is the estimated cost impact of the environmental regulations for EU steel sector? • Which are the most environmentally savvy steelmakers in the EU? The presentation begins with a global analysis and outlook for the steel long products market, focusing on recent developments in the Chinese construction sector and the implications for long products. We then turn to MBR’s outlook for crude steel production, and the recent trends in the manganese industry and our outlook for the manganese sector, before highlighting our expectations for stainless steel production and analysing recent developments in the chrome industry and our outlook for 2016. Join MBR’s Tube & Pipe team on Tuesday 13th October as they discuss the small-diameter linepipe market in this exclusive, free webinar. Following recent analysis, the team will share their unique insight into this important market. •How is it affected by volatile demand conditions, especially recent oil prices? •What is the impact of increasing sour gas and shale drilling? This webinar will be 25 minutes with extra time for Q&A. Feel free to submit any questions in advance, simply email info@metalbulletinresearch.com and use the reference “T&P Webinar”. The big story on everyone’s lips is the fall in aluminium extrusion premiums. But what is the market outlook beyond the short-term? And how best should you read the market in the medium-to-long term that will have important ramifications to your business? Metal Bulletin Research is a leading specialist in understanding, tracking and forecasting the global aluminium extrusions market, led by an expert team of consultants and analysts located around the world. As MBR launches its new 5-year outlook for the global large-diameter linepipe market, the Tube & Pipe team will present some of their findings in this free live webinar. Providing a global outlook with specific focus on North America, the CIS, Europe and the Middle East MBR’s Kim Leppold, Roman Filimonov and James Ley will share their views on how this market is performing during the challenging global market conditions of volatile oil prices coupled with increased political tensions in several regions. • How has the global large-diameter market recovered from the low demand point seen in 2013? • How do volatile oil prices impact on large-diameter linepipe demand? • What trends are we seeing in the market in 2015? Is HSAW continuing to take market share from LSAW? What's in store for the alumina market in China? • How is the market looking in China? • What is the outlook by province? • After the Indonesian import ban, where will China import its much-needed bauxite from? • What are the issues with each of these potential suppliers? Following on from his successful presentation in Miami at the Bauxite & Alumina conference, Yang Cao presents his review for this important market and provides you with an outlook for the coming year. Yang is a Senior Analyst at Metal Bulletin Research and editor of the Aluminium Weekly Market Tracker. MBR will examine what has caused prices of various flat-rolled prices to fall, why margins at steelmakers have generally risen anyway, and what are the supply/demand fundamentals to watch out for over the year ahead. We will provide our view on China’s export market share and its impact on steel prices. Dr James Ley, MBR’s leading tube and pipe consultant, will be discussing this year’s outlook for European tube and pipe markets. - Overcapacity – how is the European industry responding to this, if at all? - How does MBR expect prices of these tubular products to develop in the next half year? Fastmarkets has over 130 years of commodity expertise and aims to be the world’s leading and most trusted price reporting and intelligence service. Using transparent and auditable methodologies to report data and insights in a variety of industries, we provide interested parties with a clear picture on the markets and their effects on business and the supply chain.